Weigt, R.B., Streit, K., Saurer, M. and Siegwolf, R.T.W. 2018. The influence of increasing temperature and CO2 concentration on recent growth of old-growth larch: contrasting responses at leaf and stem processes derived from tree-ring width and stable isotopes. Tree Physiology 38: 706-720. Climate alarmists frequently claim that rising atmospheric CO2 and rising global temperatures are "twin evils" to the environment. If left unchecked, they say their unfettered increases will alter and destroy habitats and potentially lead to the extinction of untold species of plants and animals. But how realistic are such concerns? From time to time we like to interject a dose of reality into such predictions by examining the observational responses of plants and animals to these twin evils over the past few decades. It is a simple, yet profound, exercise in reality that can help free climate alarmists from the worrisome chains that bind them down from accepting truth. The present case-in-point comes from the recent work of Weigt et al. (2018), who examined ~400-year-old larch (Larix decidua) trees in the Swiss Alps in an effort to assess the relative contribution of environmental factors to their growth trends over the past century, where atmospheric CO2 concentrations rose by some 80 ppm and temperatures increased by ~2°C over the past century. So, did these old-growth forest trees actually suffer and wither away in response to increases in these twin environmental evils? Or did something more positive actually occur? Tree-ring widths (TRW) of the trees they sampled showed interannual variability and a relatively flat trend across the 100-year (1900-2004) record; but Weigt et al. report that "from about 1970 on, TRW increased in most trees," signaling enhanced growth. As for the cause of that late-20th century growth enhancement, statistical analyses showed that it was "most strongly influenced by [rising] temperature," offset only by occasional declines due to large budmoth outbreak events that would temper the upward growth trend for a year or two following the outburst. The influence of atmospheric CO2 was best observed in isotopic signature analyses performed on tree samples. There, it was determined that rising atmospheric CO2 concentrations increased carbon assimilation and enhanced δ13C-derived intrinsic water-use efficiency (iWUE, see Figure 1). In considering the above findings, it is clear that elevated atmospheric CO2 and rising temperatures are not the environmental boogeymen that climate alarmists make them out to be. Rather, as illustrated by the old-growth forest trees examined in this study, their increases are a welcomed ecological benefit! Figure 1. Intrinsic water-use efficiency of ~400-year-old larch trees in the Swiss Alps over the period 1900-2004. Mean of five trees ±1 SE with linear fit and 95% confidence interval are shown in red for the period 1900-61 and blue for 1962-2004. 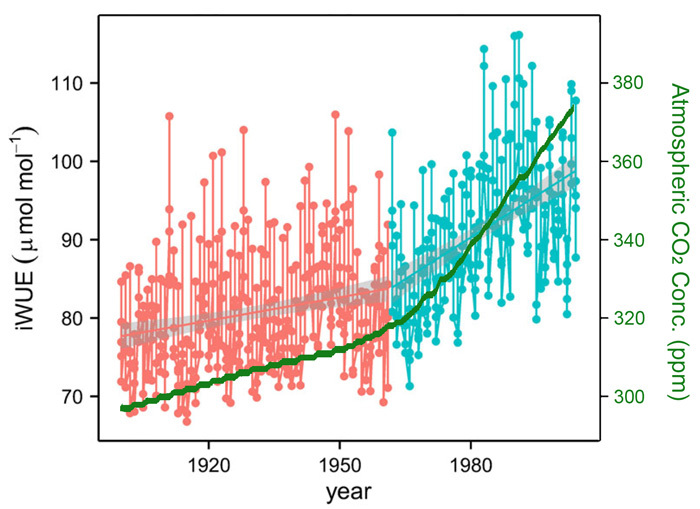 Atmospheric CO2 concentrations are represented by the green line. Adapted from Weigt et al. (2018).